As we haven’t done a “Z” card in awhile, I thought is was time for this simple fold technique. The 8 1/2 X 11 Daffodil Delight cs is cut lengthwise at 4 1/4” and scored at 5 1/2” and 2 3/4”. The score at 4 1/4” is folded forward and the score at 2 3/4 is folded back forming the “Z” fold. Retired Floral Boutique DSP is adhered to the front and back of the smaller “Z” folds. For this Night of Navy and Daffodil Delight color scheme, a white rectangle is layered onto a Daffodil Delight stitched rectangle. The multiple tree stamp from “Lovely as a Tree” is stamped twice on the white layer. 2-3 mushrooms are colored and adhered to the background. When the “Z” is pulled back, we see the message layer as well as a small continuation of the card front. Wink of Stella adds some glimmer to the trees and animals. Wink of Stella must be applied carefully to inked surfaces such as the stamped trees we see here as it will pick up the ink and smear the color. 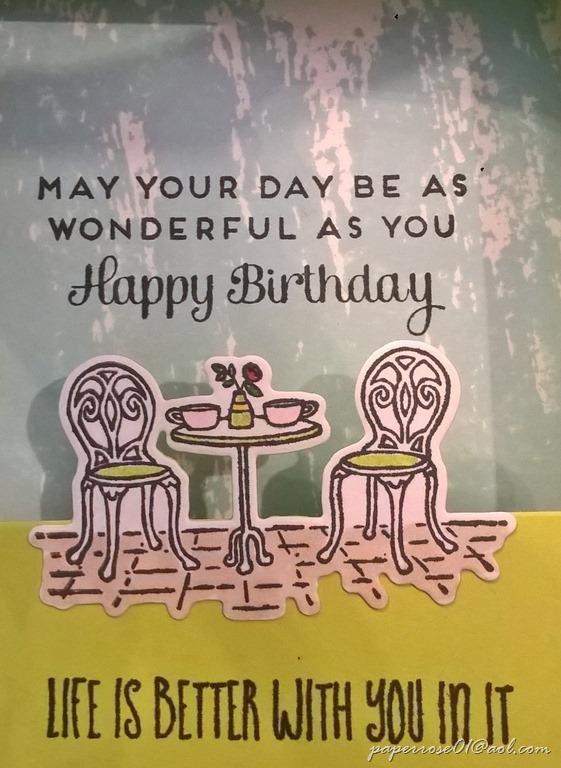 This is not an issue, however, with Stampin” Blends. 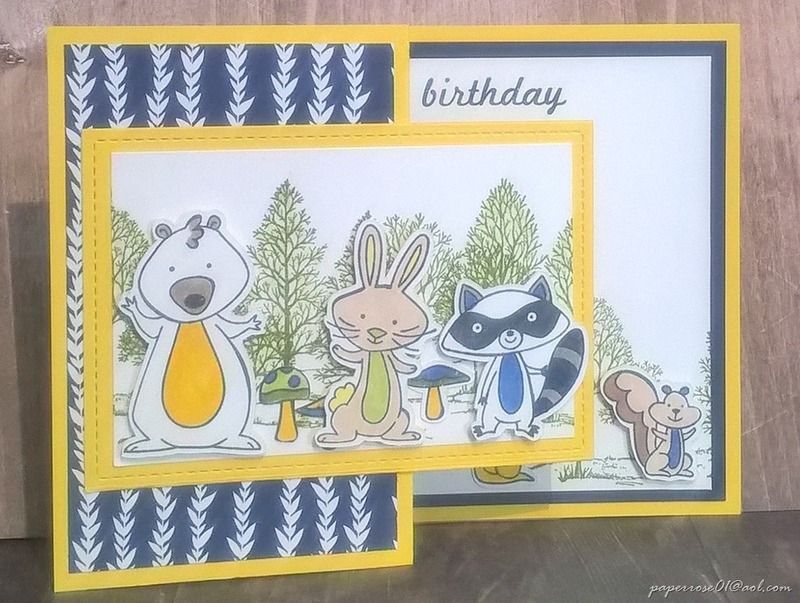 I did something “daring” with my “We Must Celebrate” stamp set – I cut the 4 animals apart. I really wanted to use them singly so I grabbed my snips and just did it. As there are no dies for this set, I stamped about 20 of each on Whisper White cs and my Brother Scan n’ Cut proceeded to cut them out. For you, this means your animals and mushrooms are cut and ready to be used. Much easier than fussy cutting! 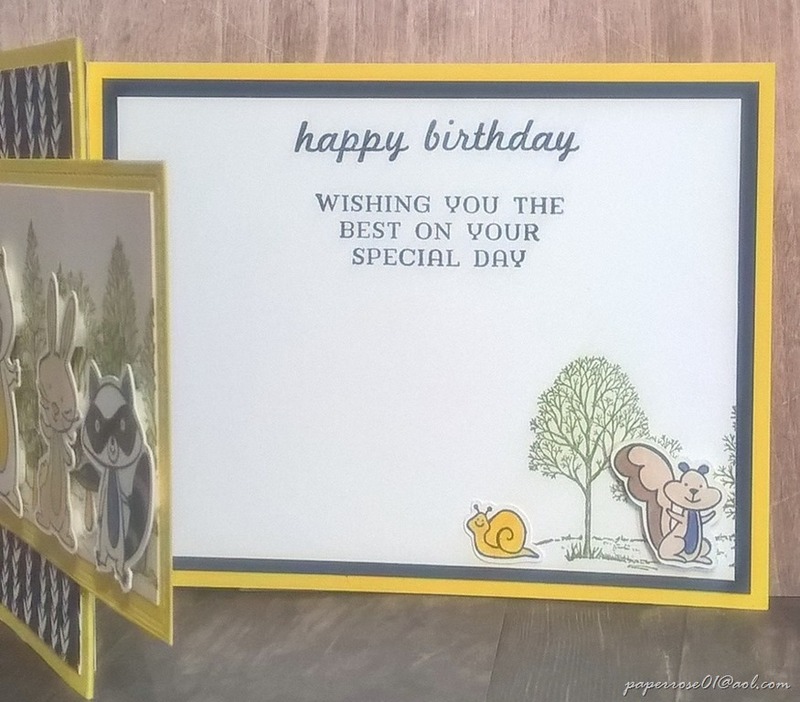 Did you know “Lovely as a Tree” is the oldest Stampin’Up set. We hold our breath every year wondering if it will retire. I broke down and bought a new “Lovely as a Tree” set this year. My old set was wood and I really wanted something easier to use. Finally, Here is everything you wanted to know about the Color Revamp that is taking place. With this revamp, you’ll have a new variety of shades that will inspire creativity and allow you to explore more sides of your crafting. Read on for more information! In addition to new colors, we also redesigned our ink pads. The case is a new, more intuitive design and we’ve improved the formula of the ink, as well! We think you will love these changes and you can learn more here. Remaining on trend and up-to-date with new products is one of the most important parts of a business and this color revamp does just that. In addition to the business aspect, this is exciting for stampers on a personal level! For people who love to create, a bigger variety of products and fresh, vibrant colors allow you to stretch your creativity and engage your senses in pushing your crafting limits. Please let me know if you have any questions on this major color revamp. I’m excited about the new ink cases and colors. Looking forward to seeing you for May Stamp Camp. 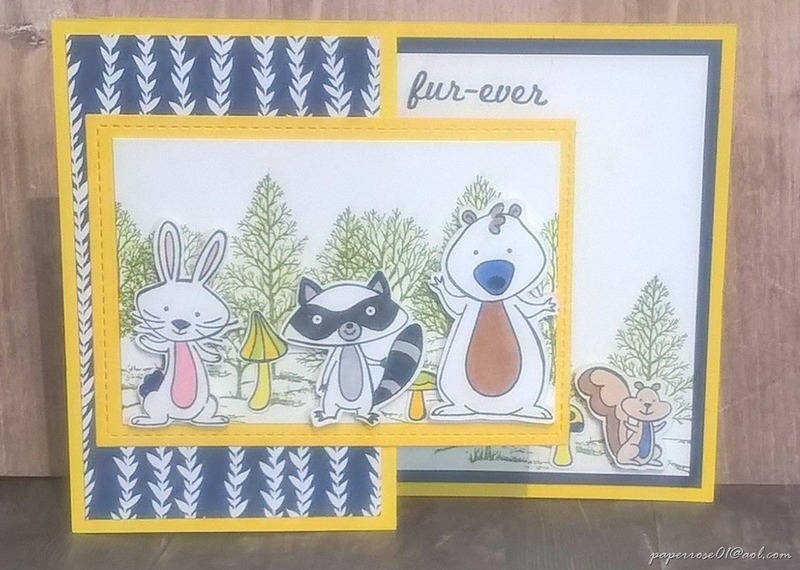 This fun-fold card was CAS’d from Cindy Brumbaugh. Cindy has a video for Charming Café on youtube and I followed it step by step by step. This see-through card is so cute. 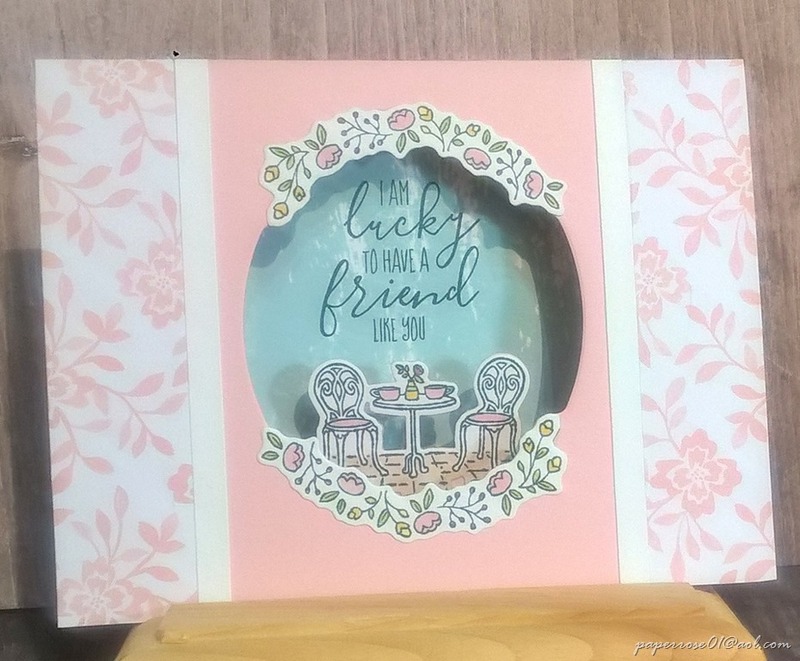 The cascade of flowers and the café scene are colored with Stampin’ Blends and Stampin’ Write Markers. The dies that are part of this bundle make cutting the individual pieces a cinch. Watercolor Wash in Soft Sky is stamped on the 3rd layer (background) and leaves room for a generous message. There is room for a second, smaller sentiment below the café table. I chose “LIFE IS BETTER WITH YOU IN IT” which is a stamp that comes with the Charming Café stamp set. The Fresh Florals Designer Paper (DSP) comes in 4 colors – Lemon Lime as used in the card above, Berry Burst, Powder Pink and Tranquil Tide. There are also 4 patterns available; I show 3 of the patterns in this post. You can use the pattern of your choice. The flower cascades and café scenes are colored to coordinate with the basic color. Ivory was used for the café floor as my Light Crumb Cake Stampin’ Blend is MIA. The café chair pads are colored in the matching pink, Lemon-Lime, or Berry Burst. The coffee cups and vase are also colored. Finally, we see the Berry Burst card. 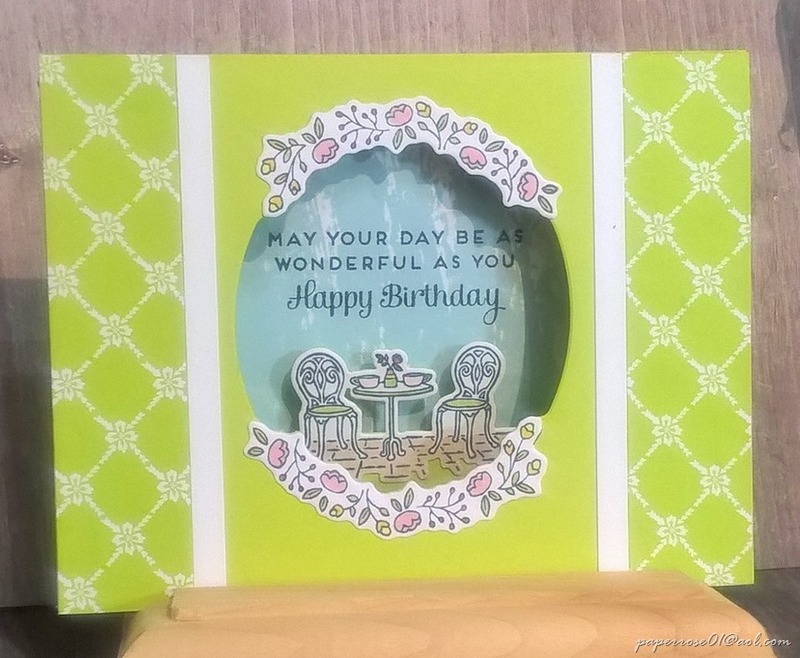 If you plan on making this card at May Stamp Camp, you MUST let me know what color you prefer – Lemon Lime, Powder Pink, or Berry Burst. 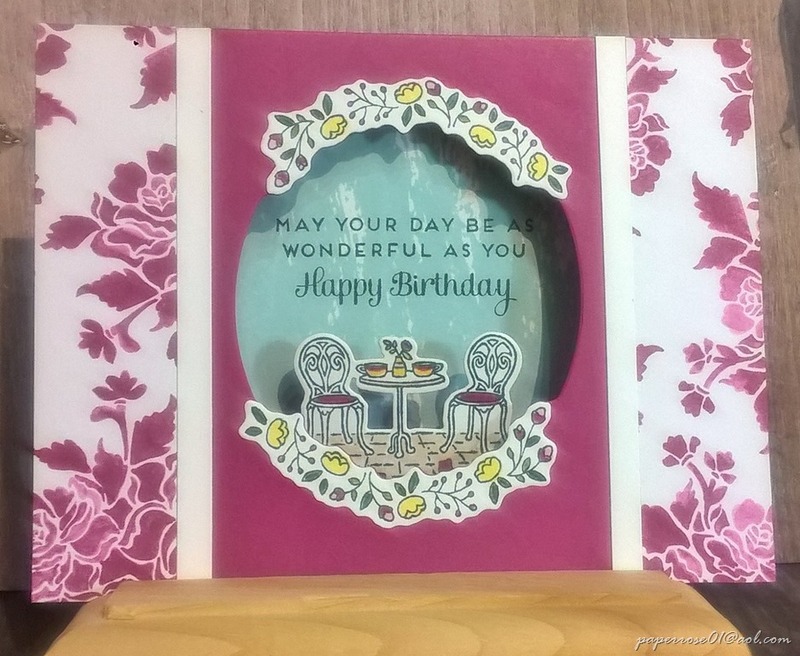 You can choose your Fresh Floral pattern as you make your card. Charming Café stamp set and framelits will be retiring the end of May or sooner if supplies run out. To see all the retiring Stampin’Up items, check out this link Retiring Products. Stampin’ Up is doing a major color revamp, something they do about every 5 years. Some of the basic colors I love will be retiring with other colors coming on the horizon. If you have some of the retiring colors, treasure them. If your ink pads become dry, chances are I have the refills and can re-ink your pads for you. Finally – May Stamp Camp will be Thursday, May 3 from 1 – 7 pm, Friday, May 4 from 2 – 7 pm, and Saturday May 5 from 9 am to 4 pm. If you can, please let me know which day you will be attending. If choosing to make Charming Café, let me know which color you prefer.